Thank you so much for having me on your beautiful site and allowing my book to keep company with so many wonderful stories. FIREFLIES by P.S. Bartlett, is a character driven journey back in time to 1881 rural Pennsylvania. A historical fiction novel with a paranormal touch, the story introduces the reader to the Whelan family, their youngest member, Ennis, and the emergence of his amazing abilities. 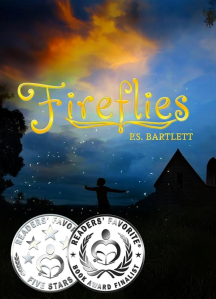 This is a story that will awe you, comfort you and give you a sense of a miraculous magic that is undeniably living within the world—if only through the natural wonder of a group of fireflies and a small boy.